Wow, a first posting. Welcome to Cocoa and Lavender! Doreen and I hope to share with you some of our favorite recipes, foodways, traditions, sources and ideas once a week. We would like to say this will happen weekly on a certain day of the week, but we know ourselves better. Just once a week will have to suffice! Now, I admit that I am writing from Tucson, one of the warmer and more meteorological safe (and pleasant) zones in the country right now. But I still want to say it gets chilly in the evening – or at least chilly enough for us to pull out our comfort food guns and revive recipes we loved when we lived in Maine, where it was cold 10 months of the year. Comfort foods. Now there should be an entire blog on that subject. But first, a little digression... Cocoa and lavender. Why the name? That is a hard question to answer as both Doreen and I are very passionate about many foods, many flavors, many aromas. For me, each day begins with a big French bowl of Italian Pernigotti Cocoa. I have yet to find a cocoa as rich, round, and floral as this one – and, even though it finally made the Saveur Top 100 this year, I have been buying it for more than a decade, mostly from chefshop.com. (It comes in kilo bags which always feels slightly suspect.) I am not a cocoa aficionado. There must be some special course or degree to get to attain that moniker. But I am serious. I need my cocoa each day – and don't confuse cocoa with hot chocolate. That is a horse of a different color, to quote our friend Dorothy. Cocoa is milk, sugar and cocoa powder. Maybe some vanilla. Maybe a pinch of salt. In my somewhat-past-middle-age years, I even use good quality skim milk. Hot chocolate, on the other hand, is melted chocolate – bittersweet, milk chocolate or a combination – in milk, light cream or heavy cream, depending on your high-fate needs that day. Maybe it is a distinction only I would make, but cocoa is a dark, not-too-sweet and intense beverage, suitable as a coffee substitute, while hot chocolate is a dessert in its own right. 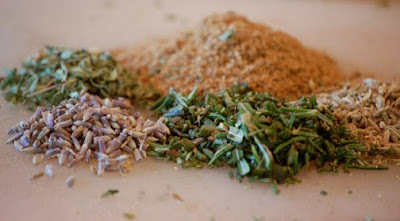 I have loved the smell since I was a child and my mother would put a lavender-scented alcohol rub on my back in the hot and sticky summer months in Philadelphia to cool me down. At that time, the idea of eating it would have been disgusting. Once out on my own, I planted more than 50 Hidcote lavender plants at my home in Upstate New York and made sachets for everyone for Christmas. But when a friend in San Francisco took me to a restaurant to try their lavender crème brûlée, my life changed. I started using it in any course of the meal. For apps, there is Purple Haze Chèvre by Cypress Grove – a cheese you can actually put together yourself if you have lavender and fennel pollen in your cabinet and a nice chèvre in your fridge. And you can serve it with a nice sparkling wine – perhaps a prosecco – with a teaspoon of lavender syrup mixed in. Blueberry lavender soup was another revelation. Thin slices of lemon with lavender buds under the skin of a chicken – pure heaven! Let your mind run wild and you can see all the possibilities for this not-often-used but magical flower bud. So, back to the comfort food du jour: Lamb ragù. 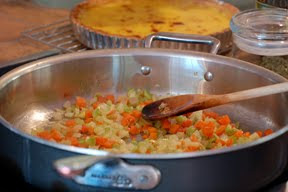 Like most ragùs, this one begins with the "holy trinity" or mirepoix sautéed in extra virgin olive oil. Once the onion and celery are translucent, the meat is added along with the herbs and spices - a combination of rosemary, lavender buds, thyme, fennel seeds, coriander and cumin. 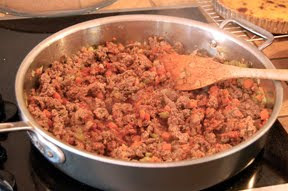 Once the meat is browned, the pan is deglazed with wine and reduced to concentrate the flavors. 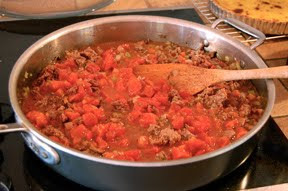 and the ragù is set to simmer and thicken for about 30 minutes until it looks like this, give or take. Depending on how I am serving this – over polenta or on pasta – I sometimes will use more tomato paste to give it a thicker texture. I have also been adding pitted kalamata olives lately, as well. I especially like this served over soft white (Venetian) polenta, as it has a coarser texture and a nice bite. I make this with 2 cups fat-free, low sodium chicken broth, 2 cups water, 1 cup white polenta and then adding about 1 cup grated Parmigiano-Reggiano just before serving. In a large 14-inch skillet, heat the olive oil. Add the onion, carrot and celery and sauté until soft and translucent, about 5 minutes. Add the meat, herbs and spices – season with salt and pepper to taste. Cook until meat is browned and much of the liquid has evaporated, another 5 minutes. Stir in tomato paste and mix well. Deglaze the pan with the red wine and cook until evaporated. Add tomatoes and chicken stock and bring to a boil. 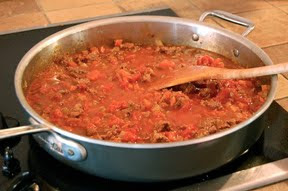 Reduce heat and simmer for about 30 minutes until ragù is thick. Keep warm which you cook the pasta or polenta. Just before serving, add in the tablespoon butter. Top each serving with a dollop of ricotta cheese and some fresh mint. The choice of polenta or pappardelle is to maximize the combination of the starch with the sauce. Thinner pastas just don't do the trick. Polenta is, to me, the perfect vehicle for this sauce, and it also makes for a wonderful lamb-based lasagne. Pernigotti is such a word from my childhood, but they were chocolates. I don´t see it anymore now. I wonder if I can still find it? And Lamb Ragu is hands down my favorite ragu. Whenever I see it in a restaurant I order it, sometimes it´s such a dissapointment! But lavender? Really? Now I have to go on a searching expedition! What intrigues me is the ricotta, never thought of adding it. I´d eat it with polenta, no doubt about that! Paula! How nice that you went back to read our first post! After looking at it, I realized how much my style has changed and how my photos have evolved. It was a fun trip down memory lane. I also realize how much my ragù has evolved over time. The ricotta is a nice foil for the lamb - I think you will like it! Lately, I have been adding kalamata olves to this ragù, which is quite a tasty addition! what a great post, loved reading about how you picked the name! reminds me of when i tried a lavender martini in sonoma... it was overwhelming but such an interesting taste. i will never forget it! Ahu - sometimes lavender is over-used and can be too strong. I really like it when it imparts a subtle floral note to a savory or sweet dish. I have made a few lavender mistakes in my life, so have learned to be careful! Ngeun - how kind of you to go back to see where this all started!I sometimes look back and can't believe all that I didn't know about writing or food photography. It is fun for me (and scary) to go back through the first few posts... Oh, and shoudl you make this ragù, there is an updated version called Lamb Ragù Redux. Much nicer. And, yes, you must definitely grow lavender! Its as good for your senses as it is for your food!